People ask if they can write their own patents. The answer is that you can but you really have to put a lot of time and thought into the process. You will also most likely not be anywhere as thorough as a patent attorney would be. 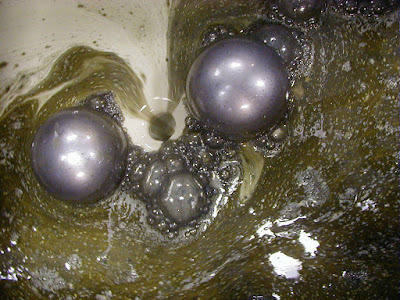 The photo is of our a suction skimmer removing oil from a manufacturing fluid. This elegant, simple, powerful skimmer was our first patent. We made the holiday post card from the photo to send as a 'thank you' greeting for our very earliest customers. The first patent my previous business partner Dave and I received was filed on Jan. 6, 1999. The 12th anniversary of our first intellectual property application is less than a month away. Our most recent patent was awarded in 2008. I wrote the text and did the drawings for our first patent. Then our wonderful patent attorney Dr. Jaen Andrews thankfully took charge. I've written for all kinds of applications in my life but I can say without any hesitation that the abstract for our first patent (below) was the single most difficult paragraph I've ever worked on. The rest of the writing - the claims and the description and the drawing labels had to be just as precise. There is a link to the full text at the end. There is excellent advice out there for writing patent applications yourself. I believe the best advice comes through Nolo Press. However, people have to understand this intellectual property language is a complex code unto itself. Many terms have been frozen in their meanings for more than a century. There is important, legally relevant meaning to every single word and phrase. Accurate use of punctuation and drawing details are equally important with highly defined legal implications. The abstract language below sounds stilted. However, the legal requirements for defining your innovation as a new creation must work with centuries of law and language. It takes a lot of time to digest these rules and then write to those standards. Civilians can do it, but thank goodness for patent attorneys! Abstract. U.S. patent # 6,183,654. Filed Jan 6, 1999. Issued Feb. 6, 2001. "A suction skimmer with a vertically adjustable inlet for removing preferred upper portions of a liquid from a fluid body under substantially laminar flow conditions and which is self leveling in response to level changes in a fluid body. Suction skimming device includes a skimming sleeve elongated body member having a fluid flow passageway disposed proximally contiguous and slidably movable along the vertical axis of an elongated body sleeve guide member having a fluid flow passageway. The fluid flow passageway of the skimming sleeve member is in open communication with the fluid flow passageway of the sleeve guide member. The suction skimmer is provided with a flotation assembly to buoyantly support the skimming sleeve member thereby positioning the inlet first end of the skimming sleeve member near the surface of a fluid body. The flotation assembly is removably engaged to the skimming sleeve member so that the distance between the skimming sleeve inlet and the surface of a fluid body can be preferentially adjusted and engaged over a large array of vertical distances." Based on this abstract our claims were accepted on their first application. There were about 45 individual component items identified across 3 separate drawings (figures) submitted. You can write this language and do the drawings yourself if you commit a lot of time to the process. It's a big learning curve. It takes a lot of time. So, yes, you can write and draw your own patents. Do you really want to? Do you have months of work-hours to devote to learning and executing in this environment? Is it valuable to utilize the professional skills of patent attorneys? Absolutely! Is it fun to use your business graphics and make holiday cards? Oh my gosh, priceless. Happy 12 year anniversary of our first patent filing Dave! Kudos to the great books from Nolo Press that guided the writing and the patent drawings that supported our first patent. First photo is of our suction skimmer in action. 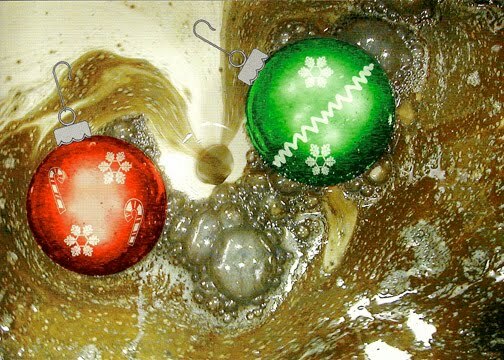 Second is a scan of a holiday card we sent to our customers and friends in the first years - our suction skimmer with the flotation system disguised as Christmas ornaments.